Delaware Mayor Carolyn Kay Riggle addresses the room at the annual “State of the City” presentation held at SourcePoint on Thursday. 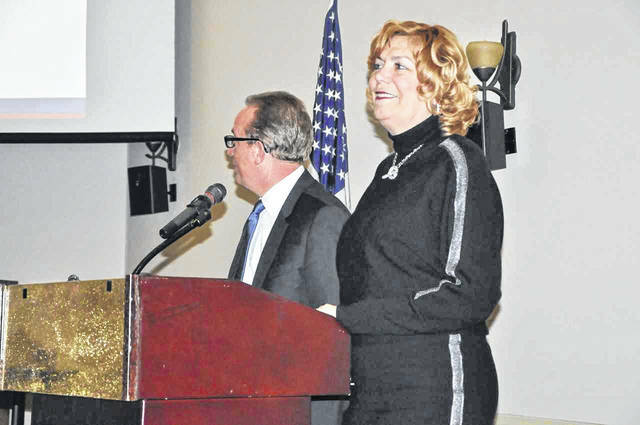 Delaware Mayor Carolyn Kay Riggle and City Manager R. Thomas Homan discuss what’s to come at the annual “State of the City” presentation on Thursday at SourcePoint. The City of Delaware held its annual “State of the City” presentation, presented by the Delaware Area Chamber of Commerce, on Thursday at SourcePoint. City Manager R. Thomas Homan and Mayor Carolyn Kay Riggle addressed a full room on what’s to come for the city in 2019 and beyond. The presentation was organized around the city’s strategic plan, with an emphasis on what Homan called the “four pillars” of the city’s work objectives. Those pillars are a great community, a safe city, a healthy economy, and an effective government. Homan said the “great community” theme was something the city struggled with in identifying what the most important aspects were to a community. What they singled out were neighborhoods, streets, open space and parks. “That’s what makes our community what is,” Homan said. His first talking point was completing the city’s bike paths and overall trail system, which he said has been seen as a high priority through surveys of residents. In particular, he said the gap between Lexington Boulevard and Kroger on the west side still needs to be completed, which he expects will be done in 2o2o. Street improvements remain a hot-button issue for Delaware residents. Homan cited the city’s “Access Delaware” program, a platform for dialogue between the community and the city on pressing transportation issues, as an important tool for ultimately improving aging infrastructure, roads, and overall access to the city. 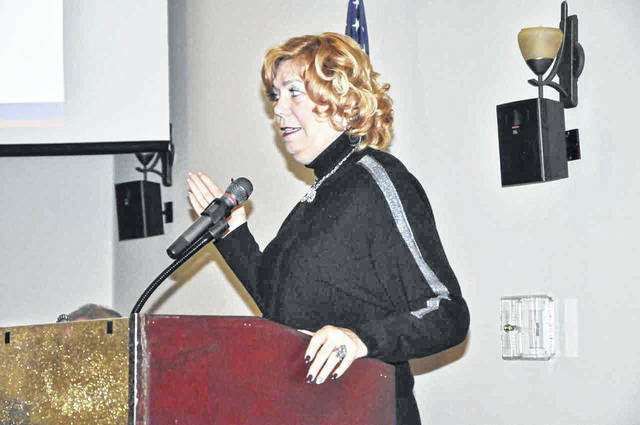 Among other things discussed relating to a great community, Riggle spoke on the construction of basketball courts at Blue Limestone Park, which she said was a need expressed to the city by the Delaware Community Coalition. Riggle said she hopes the courts will bring increased activity to the park, and Homan added the city is discussing potentially bringing a Gus Macker 3-on-3 tournament to the park in the near future. Of course, no conversation about the city’s future would be complete without addressing the topic of growth. Homan said 623 permits were issued in 2018, a number he said was a new record for the city. Additionally, 364 single-family homes were constructed — the highest total since 2004 — and 259 non-single family units were built. While the community’s opinions on apartments in Delaware are very much mixed, Homan said they are a necessity in a changing market. “We’re hearing from the development community and others that workforce housing is something important, not just to the city, but the region in general,” Homan said. Riggle, who also serves on the Delaware Planning Commission, said not only are apartments becoming increasingly popular, the market has shifted towards smaller apartments as well. She added the city needs to revamp its own guidelines for apartment developments in light of that shift. Homan went on to say the city has seen a 19 percent growth in population over the last 10 years, and the estimated population for Delaware by the end of 2019 is expected to be around 41,274. Later in the presentation, he noted 251 additional jobs and around $12 million in payroll had been created in the city during 2018. Community Affairs Coordinator Lee Yoakum detailed Polco, a new citizen engagement tool the city will begin utilizing in 2019 to provide an easy platform for city residents to weigh in on specific issues. The system is smartphone friendly, and citizens can use it to take surveys, leave comments on specific projects, or make suggestions on pressing issues. “With that information, leadership will be able to make wiser decisions based on true feedback from the community,” he said. He added there is also an online budget tool that will allow the community to interact with the city budget, adjusting it to fit their individual needs. Citizens can add and subtract — or even completely eliminate — certain areas of the budget, and through a scale, will be able to see how those decisions impact the overall budget. Riggle added if citizens are wondering why particular roads haven’t been repaired, they will be able to see what the cost of that particular project would cost on Polco, as well as be able to attempt to reconfigure the budget to free up those necessary funds. “It’s really sad that everyone wants these roads fixed, but nobody understands how expensive they actually are,” Riggle said.